New "How-to" videos show how to use our PRO Tools. Also check out our Car Design video, fun derby race video, our exclusive interview with Donn Murphy, vintage cars, and more! We even have a a cool video that is set to the Beach Boys' Little Deuce Coupe and our exclusive interview with Donn Murphy who tells you about the history of pinewood derby and how his Dad started it all in 1953. This one tool will make your axles perfectly straight, or angled 2.5 degrees, or create an extended wheelbase car, or raise a wheel, or create a rail rider. 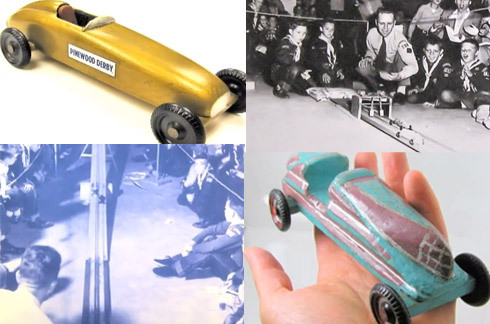 These are all proven speed tips to help you make the fastest pinewood derby car. Just like polishing your axles, polish your wheel bore to reduce friction to gain that extra race-winning speed. Straight axles win races. Crooked axles make your car steer crooked, losing valuable speed. This easy to use PRO Axle Guide helps you easily inert axles straight into the axle slot and get perfect wheel spacing with this one piece tool. Made of sturdy plastic so it won't scratch your axles. Easily insert and remove your axles without damaging your wheels or axles. Cool animation of the Pinewood Pro "logo car" racing down the track with checkered flag finish...hot and fast! This video is used as the beginning intro to all Pinewood Pro videos. 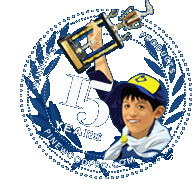 Winning Pinewood Derby races - fast, fun and entertaining video clips! Remember this? "Well I'm not braggin' so don't put me down, but I've got the fastest set of wheels in town!" I took these videos at multiple Cub Scout Pack races in the area, picked some of the emotional clips (there were many more!) 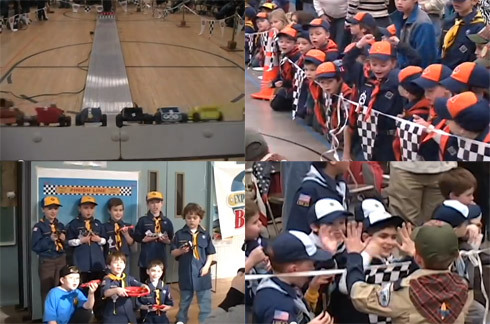 and then set the video to the Beach Boys' Little Deuce Coupe music...lot's of Cub Scout emotion and derby fun, exactly what pinewood derby is about. This is a great video to share with your Pack when giving out their kits or on race night. Who started the pinewood derby? 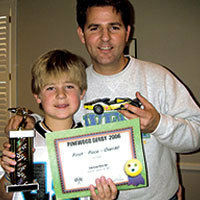 Donn Murphy, son of the inventor, talks about the history of pinewood derby in this exclusive Pinewood Pro interview. Donn talks about how his father invented the pinewood derby in 1953 citing excerpts from his father's book, PINEWOOD! 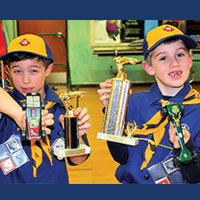 The Story of the Pinewood Derby, while Joe Gargiulo talks about his book, Winning Pinewood Derby Secrets. Video features many pictures from the very first derby race in 1953. 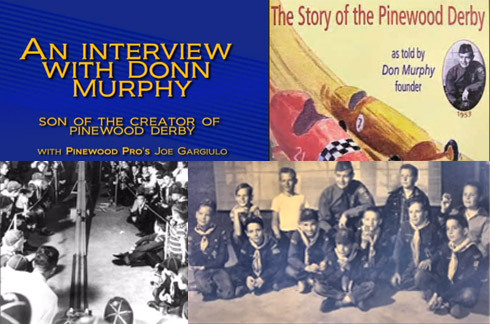 For any scout or pinewood derby historians, I would strongly recommend reading a Pinewood Pro's brief history of the pinewood derby and also picking up a copy of Don Murphy's book that gives full details, complete with pictures from the orginal race, original drawings, rules, etc. A great resource for any Cub Scout Pack. 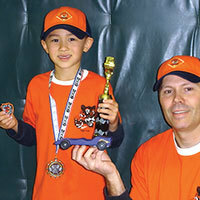 Pinewood Pro interviews one of the first pinewood derby car builders in the country. Craig built two cars in 1955 and 1956, soon after the BSA launched the pinewood derby event for the Cub Scout program. Craig speaks about his cars while Joe from Pinewood Pro speaks about the start of pinewood derby racing, which began in 1953 but wasn't introduced by BSA until late 1954, making 1955 the first year of pinewood derby racing by the Cub Scouts. If you have a bad wheel and you don't have time to replace it, Raise that Wheel so it doesn't touch the track. Since it doesn't touch the track, it won't have any negative affect on your car's speed.